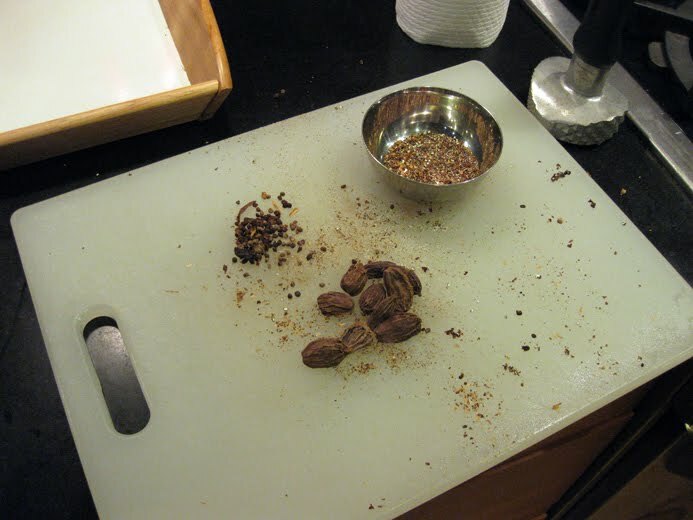 Last fall I got together with my friends Noah and Alex at Noah's place to brew a big, dark saison seasoned with blackened raisins, rosemary, and orange peel. The base beer turned out alright, but the funky portion to which we had added the dregs from various sour beers turned out fantastic, a blend of earthy funk and dark herbal complexity. It turned out so well in fact that this year we decided to brew a 15 gallon batch of dark saison, and sour the whole thing. 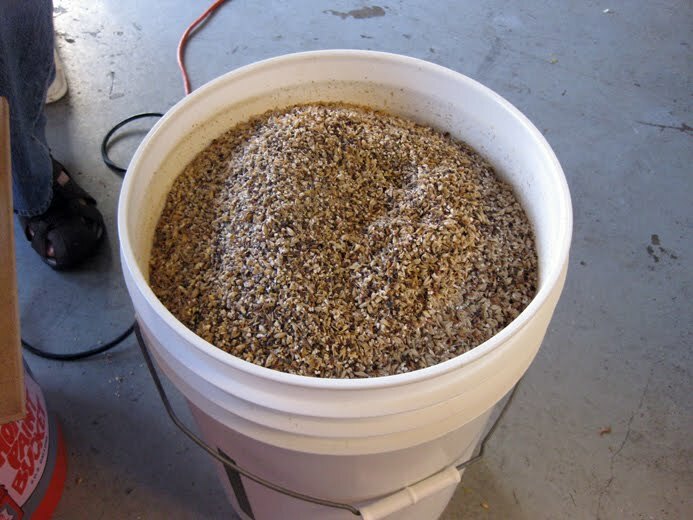 While the basic concept of the beer remained consistent the recipe itself went through some big changes in regards to the malt, yeast, and spices. 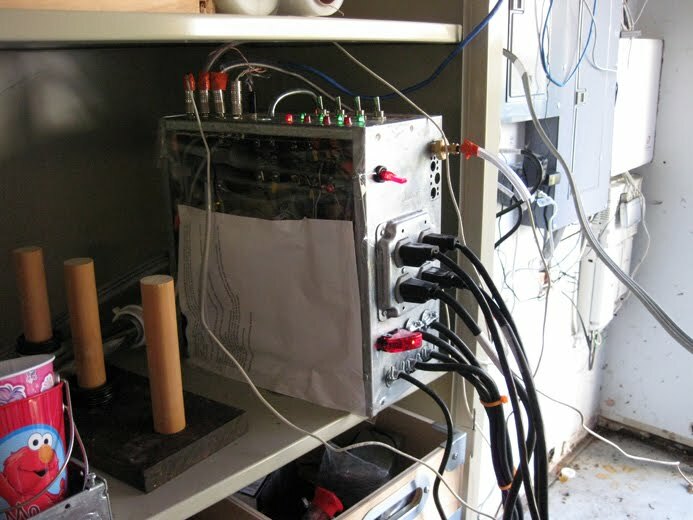 Noah's brew system had also gone through some changes, making it now approximately four times more complex than mine (no I'm not really clear what that box does either). The malt bill was overhauled, making it much more complex this time around (not my idea) but for something funky I don't mind some extra complexity (and unfermentables) from the additional crystal and dark malts. We got some extra fermentables from caramelized dates instead of the raisins we used last year. 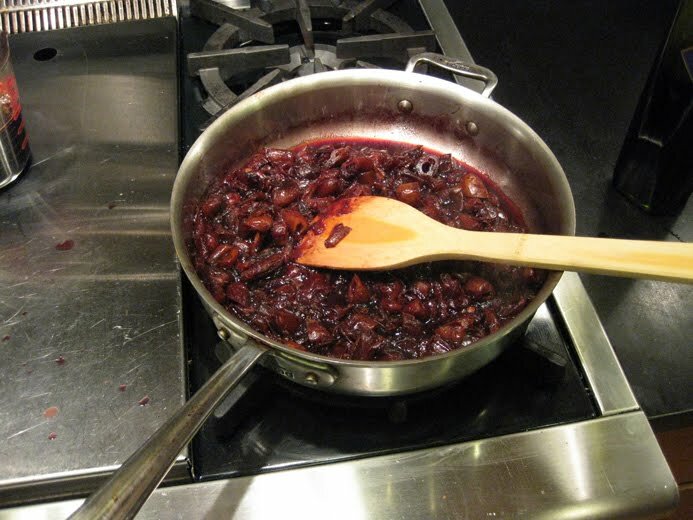 We deglazed them with a bit of the final runnings which we boiled down to a thick syrup, along with a cup of red wine. They were then pureed with a stick blender and added this paste right at the end of the boil. 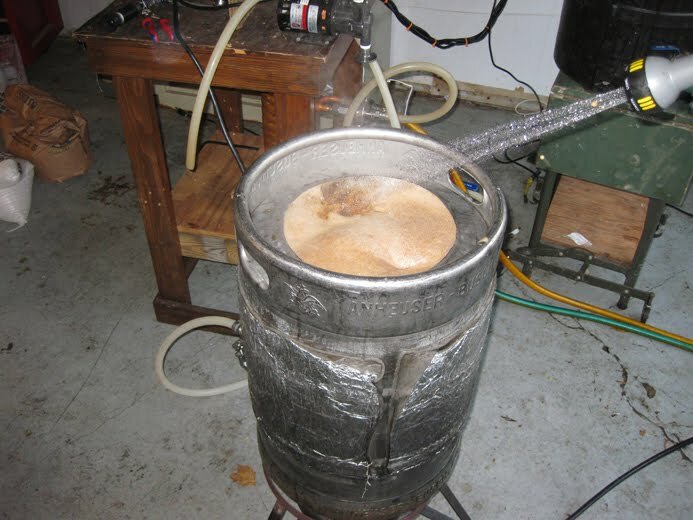 We didn't get great efficiency because the boil kettle size limited us to collecting only 12 gallons of wort. As a result we added light dry malt extract so we could get a full 15 gallons of 1.078 wort out of Noah's keggle system after topping off with water post-boil. This time around we replaced the rosemary with black cardamom, an African cousin of the more common green/white variety. It has a darker more complex flavor (notes of smoke and creosote), and is most often used in African and Indian cooking. We erred on the side of caution going with just 3 g of the crushed inner seeds added with 2 minutes left in the boil. We had also intended to add the zest from an orange as we did last year, but between the activities of brew days and the microbial harvesting we forgot to add it. The yeast changed from one Wyeast VSS saison strain to another when we replaced the 3725 Bier de Garde with 3711 French Saison. The yeast cake for the 15 gallon batch came from the Hoppy French Saison I had brewed a few weeks earlier. The bugs came from a variety of sour beers, both commercial and homemade that we sampled during the brew. At least we kept the hops pretty much the same going with 2 oz of Amarillo to bitter. 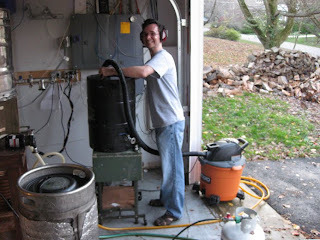 With the mash finished Alex vacuumed out the spent grain using a shop vac, seemed like a good way to get rid of that large a mass of wet grain if your mash tun is too heavy to lift. Seems like this is becoming a yearly tradition, hopefully this batch lives up to its predecessor. 2.00 oz. Amarillo (Pellet 8.00% AA) 60 min. 3 g Black Cardamom Seeds 2 Min. Brewed 11/15/09 with Alex at Noah's house. 3 grams of black cardamom (inner part of seeds ground) added with 2 minutes left in the boil. Dates caramelized in pan, deglazed with 1 cup of red wine, and then 5 cups of first runnings that had been reduced to ~1.5. Cooled to about 72. Pitched slurry from my Hoppy French Saison, plus the dregs of numerous homebrewed sours, as well as a Russian River Consecration and Jolly Pumpkin Bam Noir. Oxygenated with 60 seconds of pure O2. Strong hard fermentation in my basement. Did not ramp the temperature up in an attempt to save some fermentables for the bugs. Soaking some Hungarian oak cubes in port to add when I transfer to secondary. Alex added orange zest to his as well as wine soaked oak cubes. Noah is going with Grand Marnier soaked oak, it will be interesting to see how the batches differ. 11/29/09 Boiled 1 oz of house toast Hungarian oak cubes in water for just a few minutes. Poured ~1 cup of port over to cover. 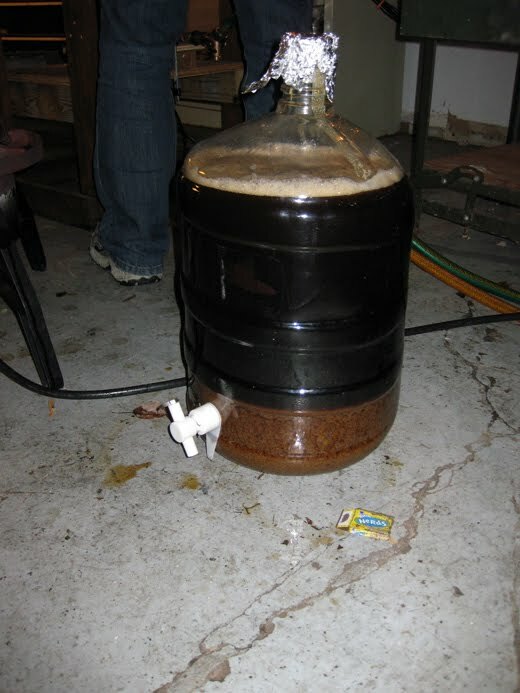 12/06/09 Racked to secondary, gravity down to 1.012. Added port and oak cubes. Put back in the ~60 degree basement. 10/14/10 Racked half of the beer onto 3.5 lbs of Cabernet Sauvignon grapes. 10/15/10 Bottled the remaining 2 gallons of beer with 1 5/8 oz of table sugar. 12/9/10 After a year it is doing pretty well, with the cardamom is at about the right level. It is tart, but not sour with layers of complex savory flavors. 3/12/11 Bottled the 2.75 gallons of the cabernet portion 1.625 oz of table sugar. Aiming for 2.4 volumes of CO2. Added 1 gram of 71B-1122 to the bottling bucket. 10/13/11 The Cabernet portion is terrific, more sourness than plain, and muted spice. So many changes from the last batch, it will be interesting to hear where this ends up. It's nearly time to crack open my "Courage" RIS for the year; notes after. Thanks for sharing the info. 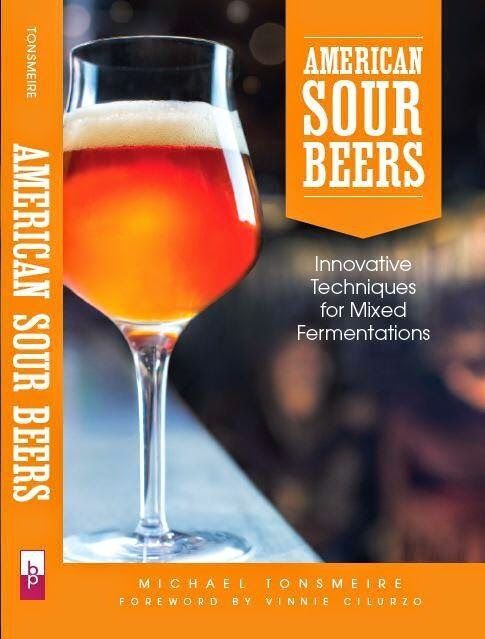 I want to do something like this with my next batch, a saison. Since wyeast's Belgian saison strain stalls out around 1.035, I think I may add my Orval dregs at that time instead of warming it up like I normally would. I just wonder if 1.035 is too soon. I know many add it at the end of primary fermentation, but this saison yeast has such a high attenuation rate. I am concerned there would not be enough for the brett dregs to eat if i allowed the saison yeast to finish before adding dregs. Maybe I should wait for a lower gravity to pitch the dregs? This would all be done after racking to a secondary where it would age for 8-12 months. Now I read this post and wonder if I should add the dregs before the saison yeast. Any suggestions would be much appreciated. I'd probably add the dregs along with the saison yeast, that way the Brett gets some time with oxygen and simple sugars to grow. 1.035 is pretty high to expect the dregs to finish the beer out dry, I'd warm it up a bit and try to get it down to ~1.020 before giving the Brett time to finish it off. I've actually found that it doesn't take Brett much gravity to give the beer some funk, it is really the lactic acid bacteria that need gravity to sour a beer. My batch is still sitting in secondary, I’m in no rush to bottle it since I can’t see drinking much of it until the late fall. If you are thinking of doing black cardamom I might cut it back even more, although I’m not sure how much it will continue to age out. Glad you’ve enjoyed the blog. Good luck on the batch. Thanks for the reply, man. Would you rack the beer at 1.020 into a secondary? Does Brett suspend well enough to be effective in the secondary for about a year? I'd just wait until the primary fermentation is finished before racking (you'll have to figure out a mashing schedule to hit your target pre-funk gravity). The Brett will stay active as long as there is sugar to eat, it is a slow flocculator. Not sure exactly how long it will take to finish out the beer, Brett will often get the job done in less than 6 months alone (it tends to be the more complex microbe blends that take years to develop). I tried making this recipe with a few changes (such as D2 syrup in place of extract) today spur of the moment. Out of curiosity, did you leave this on the oak cubes for months as the notes suggest at the bottom of the post, or remove/rack it off after a shorter time? While I've done a couple big barrel projects, I don't mess with oak cubes as often as I probably should. . .
Yep, sat on oak for quite a long time. I've found that using less oak for a longer time gives greater complexity than more oak for a few weeks. Hope it turns out well, good luck! Thanks! I ended up not cutting back on the cardamom, and you're very correct on that one! It's not ridiculously overpowering, and I'm sure some of the aromatics will blow off during fermentation, but I didn't realize how pungent the black type is! What, no tasting notes? After trying a black Saison I'm keen to give one a go, and your grist is intriguing. Look at the bottom of the post in the notes section of the recipe, there are links to both the plain and Cabernet portions.